What I love about yaki udon, or stir-fried udon noodles, is how easy and versatile it is to make. You might have to head to a Japanese grocer for some of the ingredients, but the trip is well worth it. The key to success in making yaki udon is to sufficiently brown the noodles so that they soak up the sauce without becoming mushy. Make sure to use a nonstick frying pan so that the noodles don’t stick, otherwise you’ll end up with a mess. 1. In a bowl, combine the soy sauce, mirin, 1 1/2 tablespoons of the bonito flakes, and kelp and let sit for at least one hour and up to three days in the refrigerator. Strain and set aside. 2. In a large pot of boiling water, cook the udon for about 1 minute less than the time indicated on the package. Drain and rinse with cold water in a colander. 3. In a large bowl, mix the cooked noodles and the concentrated, strained sauce. 4. In a large nonstick frying pan, heat 2 teaspoons of the oil over medium-high heat. Add the noodles and sautee until the soy sauce is fragrant, about 1 minute. Add the remaining teaspoon of oil, the surimi slices, and the remaining bonito flakes. Toss well and season with salt to taste. 5. 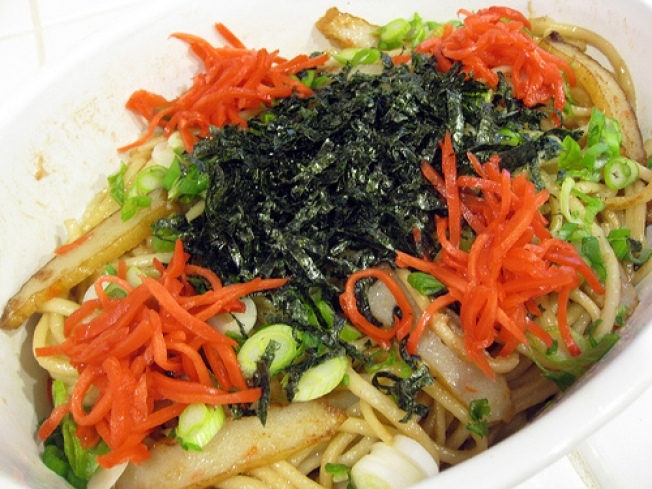 Place the fried udon noodles on a serving plate and top with the nori seaweed, pickled ginger and green onions.